This year I strove to write a letter to both of you for each month you turned older. I'm sorry that I missed last month's update. It may be trivial to most people but to me, it means that I have lost the chance to capture the little memories I have with each of you, and the big milestones that you achieved as your bright minds absorb new knowledge and skills. Last month you celebrated your first ever Aidilfitri. 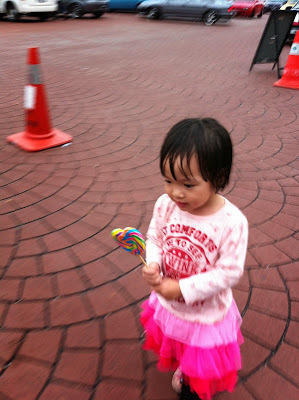 You were excited of exploring new places (huge space to crawl about back at the kampung!) but fretful of meeting new faces. Your first Hari Raya outfit was yellow kurung with purple polka dots and purple sarong, and I was so excited about putting on identical outfits for you and your sister. 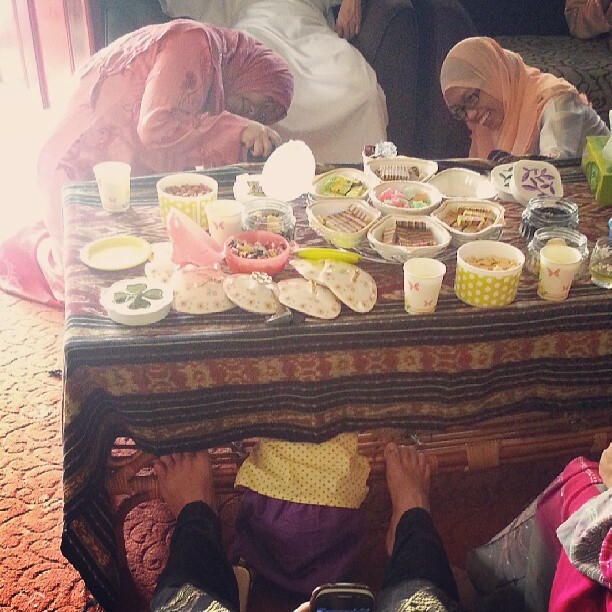 Khadeeja crawling under a table at a relative's house! 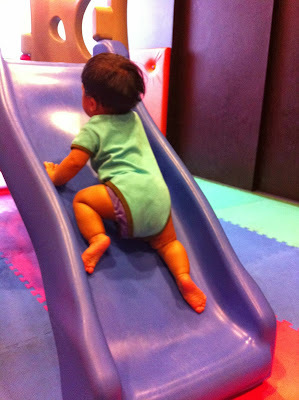 At 8 months old, you have grown 6 teeth, learnt how to stand and even how to climb. Yes, climbing. When other babies this age have just mastered the skill of sitting on their own, you have gone beyond that and are now climbing out of your walker. Mommy pengsan! 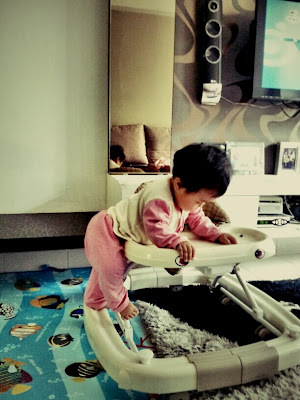 Climbing out of the walker! Well, to give me even more headache, this month you upped your skills by walking baby steps. Walking, my mocha latte! A couple of times I caught you standing without holding onto anything. Then you took a few steps but when you realized that you were not holding onto anything you stumbled and fell on your cushy bum! The good thing about you is you don't cry easily when you fall down. You simply continue crawling or trying to stand up again - life moves on for you. That's the spirit baby! You only cry when you are sleepy, want your milk supply, a cuddle, or when you fight with your sister. Speaking about sister fight, oh yes. Somehow some time between last month and this month, you stopped being meek and helpless when your sister pushes you or takes away your toys. Instead you fight back - shrieking, grabbing your sister's hair, pinching, and most recently, you even resorted to biting! Oh no, Khadeeja! I'm amazed but appalled at the same time - what kind of girl am I raising who can fight back at the age of 9 months? The things you can do Khadeeja, can leave me speechless. Not you though. When you are in a passionate mood, you will let the world know your feelings - shrieking in fury, or in excitement during one of those days when your sister obliged and played with you. 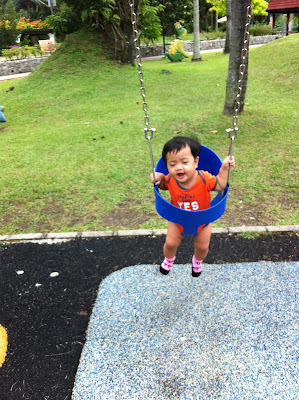 Loving your first swing ride all by yourself! But above all, your most awesome achievement this month is you uttered your first word. 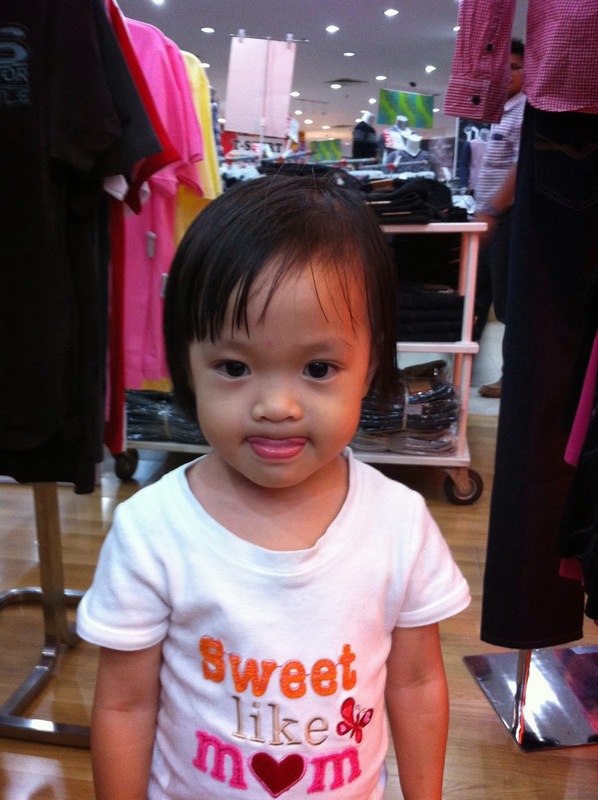 Unlike your sister whose first word was 'Bapak', you opened your mouth and spoke, 'Mak.' I felt like bursting into tears! It felt so good to being acknowledged by my 9mo baby! If Khadeeja is the apple of my eyes, then you are my rainbow that lifts up even the gloomiest of my days. Khayla, once upon a time, I used to fret because you weren't talking in full sentences when others your age have done so. Last month you stopped going to school, but strangely your vocabulary started to improve and you are now talking properly. To make it more amazing is, you chose to speak in English, even though we spoke in our mother's tongue to you. The most adorable thing about you and your little speech is the fact that when you do something nice to others, you would prompt them to thank you. Like, when you give a toy to Khadeeja you would stand in her face and repeatedly say, 'Thank you Khadeeja?' And since your baby sister still could not understand the concept of gratitude, I had to step in and thank you on behalf. Only when you receive your thanks, you would move away and continue your life. One thing that has not changed since you were a baby is your fondness for going out and exploring the world. Ok, I'm sure by the time you can read this letter, you will roll your eyes at me and point out that it's a typical 2-years-old behaviour. So what's new? Gee mak, can you come up with a much more original observation? I know, I know, Mommy's being lame… But you have to know that at this time I'm too much preoccupied with my studies and the fact that I could still notice your development takes quite a bit of effort ok sayang. But one thing for sure, I would always have my eyes on you and Khadeeja. When you both went to bed, I would spend a few minutes stroking your hair, thinking - God, they grow up so fast. I wish they would stay babies for a while longer. Please, let them be my babies for the rest of my life. I love you both, most passionately, fiercely and tenderly.